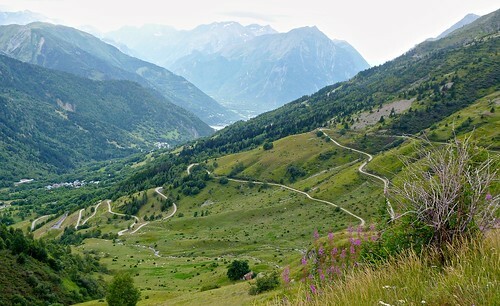 Col du Sabot starts just a few kilometres from Alpe d’Huez. But it’s higher, harder, prettier, and has a fraction of the traffic. On the downside? Beware of gangs of sheep. 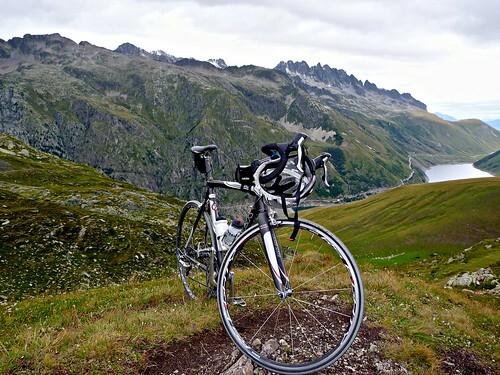 Cyclotourists flock to Alpe d’Huez and the Route des Grande Alpes often forgetting that there are many other interesting choices. Sabot is hard work. Throughout, there are some very steep stretches on this beautiful route. 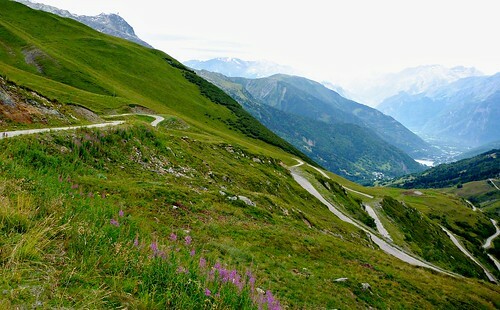 The first few kilometres climb to Vaujany – a small ski station. A couple of kilometres after Vaujany the route surface becomes fairly mediocre. It’s just a little single lane road – but it’s definitely fine on a road bike. Just descend prudently. But this top part is certainly the best part. Wonderful hairpins, mountains everywhere, great views. At the Col, you can see over the other side. 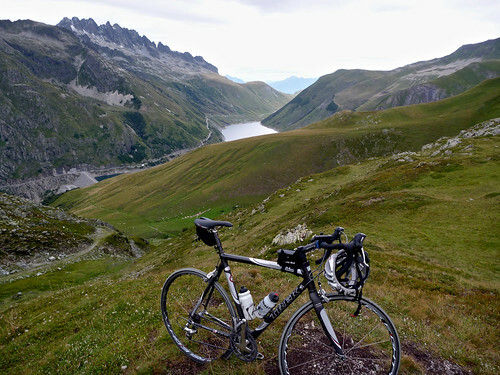 Wonderful views of the route to Col de la Croix de Fer and the dam Lac de Grand Maison. 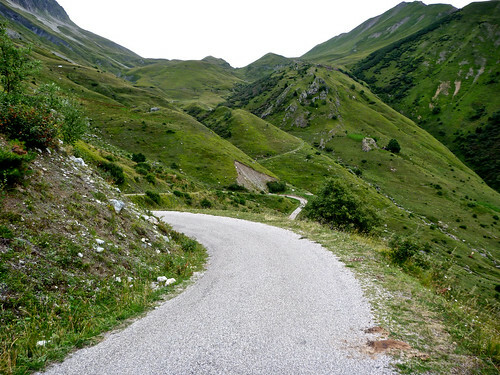 From Vaujany there is another climb to Collet – I have added it to the map. The top is 1705 metres, with about 4.5 kms @ 10% from the village. See the Bastien’s web site for great photos and more details. 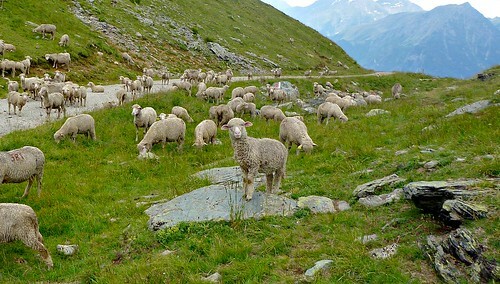 After eating and taking a couple of photos at the top, a horde of sheep decided to block the road down. Note, the photo is not from the road …. I walked across some rocks to avoid these evil devils. Bravo ! J’adore le col du Sabot. C’est surpeuplé là haut !! What a fantastic ride! With spectacular views all the up and a stunning view of Mont Blanc greets you at the top. stopping and having a burger! Delicious, then you can continue down hundreds of vertical meters to reach the valley floor and Allemont. There is a charming chalet named Saskia run by SkiPeak in Vaujany that I would highly recommend in fact I am here right now having just finished the aloe d’huez hairpins, nice to come back to luxury!! Another perk with skipeak is that staff will pick up cyclists after a lon ride or drop then off at a start and with a rather swanky bike trailer they can easily ferry groups of cyclists to their desired destination brilliant! First of all, I want to wish you a huge “Thank you!!!! !” for this incredible and informative website. I just finished riding Col du Sabot and it was amazing. 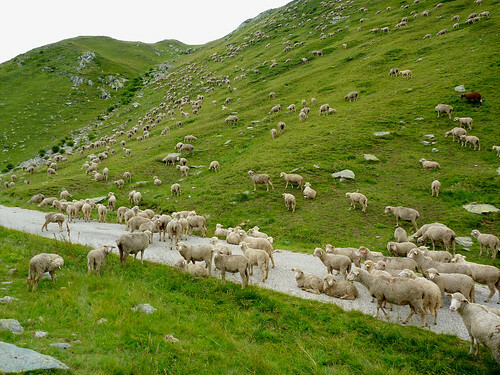 I felt sorry for all the other riders I saw battling Sunday traffic on Alp d’Huez and other roads. I saw exactly 1 car after Vaujany. Coming from USA, I wasn’t sure where to ride but you saved me! 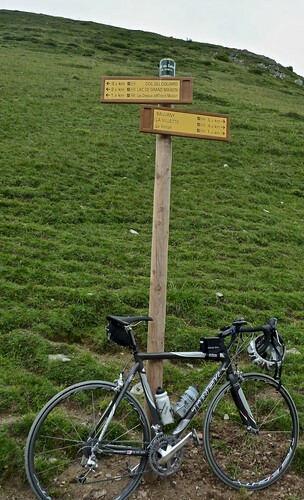 Col de Sarenne loop and Col de la Croix de Fer were perfect as well. Do you accept donations? 🙂 Thanks again and keep ’em spinning! 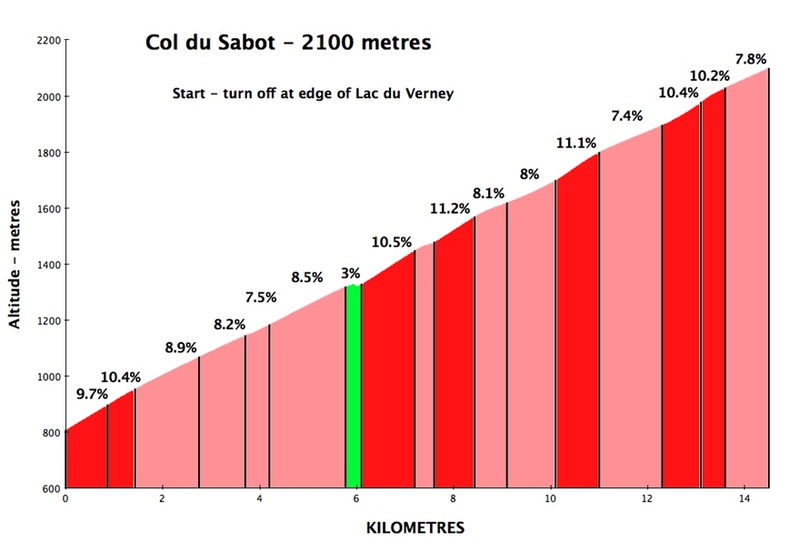 im planning to go from Villard-Reculas via Vaujany to Col de Sabot and then proceed to Col de Glandon. Any Idea if it is possible to descent with the bike (ATB) to the Lac de Grand Maison or do i have to go the whole way back to Verney? Its looking nice on the satelite photos and on Google Earth, but did anyone go the route before with a bike on his back? Thanks for the fascinating views and interestig reports. I am not certain, but pretty sure that you need to turn around. I remember looking over the top and seeing no obvious way to continue down. After the hectic ride of D’huez this was an absolute revelation. . A friend and I took our CX bikes up there today. Stunning views on the way up although we were shut down at the top by cloud. Still, we got there and loved every meter. Many thanks for this website. It’s a fantastic guide.